If you started playing Destiny today, you may have noticed an unusual number of your friends doing the same ancient low-level mission. Why would they do that? The answer—of course this is the answer—is that the mission lets players take advantage of a new loophole and earn lots of powerful exotic items with a minimum of effort. UPDATE: As expected, the Tuesday after this exploit was discovered, Bungie issued a hotfix that slows down the rate of exotic drops when using Three of Coins. 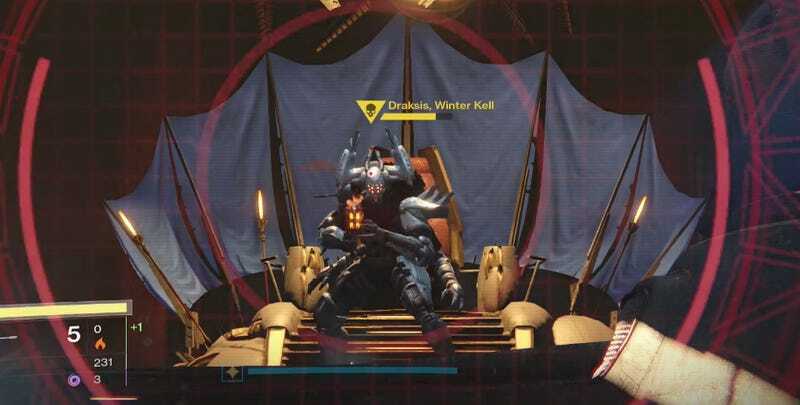 It’s still possible to farm the exotics, but you’ll have to wait a longer time between killing bosses. It was fun while it lasted. The weekend vendor Xur has returned for the first time since The Taken King expansion launched on tuesday. Xur usually sells a few exotic items and engrams in exchange for strange coins. This week, he started selling a new item: The Three of Coins. You can buy a pack of five for seven strange coins, and if you use one before fighting a named boss (an “ultra” in Destiny parlance), it’ll give you a solid chance of getting an exotic engram. Naturally, players have already figured out a way to take advantage of the system. I first saw this technique thanks to redditor KinetiClutch—if you go to the “Scourge of Winter” mission on Venus, you can farm the boss for a ridiculous number of exotic engrams. I’ve tested it out and yup, it works. Buy a bunch of Three of Coins packages from Xur. Start the Scourge of Winter mission on its lowest difficulty. Equip Ice Breaker—if you have it—and a rocket launcher. Run to the opening area, then kill all the Kellsguard. When Ghost says you have to go find the Kell, keep moving. Run through the rest of the level and onto the Fallen ship—you’ll be basically unkillable because the enemies are so low level. Don’t stop to fight anyone, just run to the end. Before you go into the final room, pop a single Three of Coins. Walk into the room and immediately snipe the boss Draksis a few times to get his health to the point that a single rocket will kill him. Run straight up to him and shoot him point blank with a rocket. It’ll kill him and you, but he’ll still drop an exotic engram. If he doesn’t drop an engram, repeat. Use another Three of Coins, then suicide-bomb the boss. The Three of Coins stacks its exotic probability each time you use it, so you’ll get an exotic engram in two or three tries. Keep going as you see fit. Enjoy your exotics, even if you feel slightly dirty about it. Really, this isn’t even that much of an exploit—the Three of Coins is almost working as intended. It’s likely that Bungie will patch it so that bosses only drop engrams if you survive the fight, but even if Draksis didn’t drop an engram along with your death, you could just restart the level, run through it, and get to him in a few minutes a pop. It’d be less convenient, but not grossly so. They could also make it so that the Three of Coins only works for high-level bosses. We’ll see. Whether or not Bungie patches this exploit, the Three of Coins seems like it’ll make it far easier for Destiny players to get every exotic in the game. Given how annoying it used to be to wait (and wait, and wait) for that one stupid exotic item that the game refused to give you, that’s a pleasant change. You earned those coins. Have fun spending them. The Nine may be delighted that you’re blowing them all now.